Enjoy a 20-mile round trip Fall Foliage train ride between Lakeville and Industry aboard restored vintage streamlined coaches. Train rides depart from Industry Depot every half hour, ticket includes railroad museum admission. 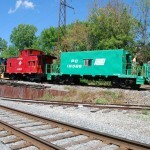 Ride aboard ride freight train cabooses July 16-17! Train rides depart every half hour from Industry Depot, ticket includes railroad museum admission. Industry Depot is located at 282 Rush Scottsville Road, Rush NY, 14543. We are easy to find from Exit 11 on I-390, and just 20 minutes from downtown Rochester on Route 251 West! Your ticket includes a train ride and admission to our museum grounds and exhibits. Ages 4 and under ride free, no ticket required. Special Event ticket pricing may apply on certain days. See web site for details. The Rochester & Genesee Valley Railroad Museum can trace its roots back to 1937 as the Rochester Chapter of the National Railway Historical Society. Since our museum was established in 1971, we have preserved more than 40 pieces of historic railroad equipment along with our 1909 Erie Railroad passenger station to bring Rochester's rich railroading heritage to life. From exciting festivals to diverse history, discover all Rochester has to offer! From New York City to Niagara Falls, New York State has something for everyone! We are proud members of the Heritage Rail Alliance. Rochester Train Rides is a project of the Rochester & Genesee Valley Railroad Museum located in Rush, New York, just 20 minutes south of downtown Rochester and an easy drive from anywhere in Western New York. The only museum where you can ride the exhibits! We offer fun and family-friendly vintage train rides that bring Rochester's rich railroading heritage to life. Our collection includes trains from the New York Central; Lehigh Valley Railroad; Erie Railroad; Baltimore & Ohio; Buffalo, Rochester & Pittsburgh Railway; Pennsylvania Railroad; Rochester Subway, Kodak Park Railroad, Rochester Gas & Electric; and many more. All trains depart from Industry Depot which is easy to find off Route 251. We are not affiliated with the New York Museum of Transportation or the Trolley Museum of New York. We are not offering any trolley rides this year.